The 2018 Chevrolet Cruze is the ultimate car, whether you’re looking for a sedan or a hatchback. Check out why you should take the Cruze on a cruise today. The Chevy Cruze has a smart and aerodynamic design creating a sporty appearance. The Cruze will fit whatever lifestyle you lead with both a sedan and hatchback design. The sedan has plenty of legroom for rear seat passengers while the hatchback gives you room to store all of your cargo. 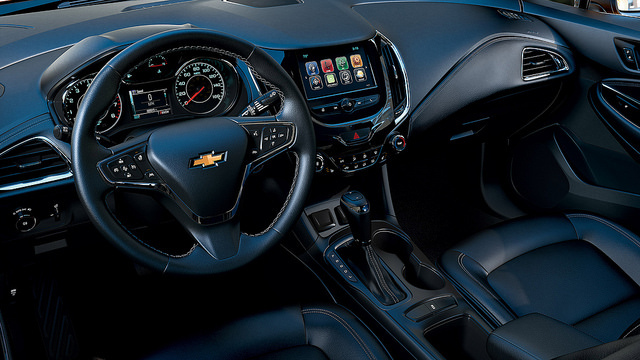 If you want top technology, look no further than the Cruze. It comes with OnStar 4G LTE Wi-Fi. Not only do you get protection and assistance from OnStar, you’ll also get connection to a high-speed wireless network that makes it easy for your passengers to do work on-the-go. “Environmentally-friendly” isn’t necessarily a euphemism for “boring to drive.” With a standard 1.4L turbocharged engine (1.6L turbo diesel), you’ll get up to 153 horsepower and 177 lb-ft of torque while still earning at least 40 highway mpg (137hp and 240 lb-ft of torque with up to 52 mpg hwy with diesel). It’s the ultimate combination of efficiency and power. The number one priority of any car and any driver should be safety. Thanks to a host of driver-assistive technologies like Forward Collision Alert, Side Blind Zone Alert, Teen Driver Technology, and Automatic Crash Response, you’ll feel safe and confident on the road at all times. The 2018 Chevy Cruze is waiting for you at Landmark Chevrolet in Randolph NY!